So went the lyrics of a song we used to sing at Primary School, called “The Family of Man”. In those days, living as I did in North-West England, the Rhondda felt just as far away from me as China; I’d no real knowledge of either and both felt like alien worlds to me, places where strange people did weird things that made the world go round. I’d certainly have been surprised if you had told me then I’d have visited both, especially if you’d gone on to say I’d go to Beijing first, 12 years before South Wales. 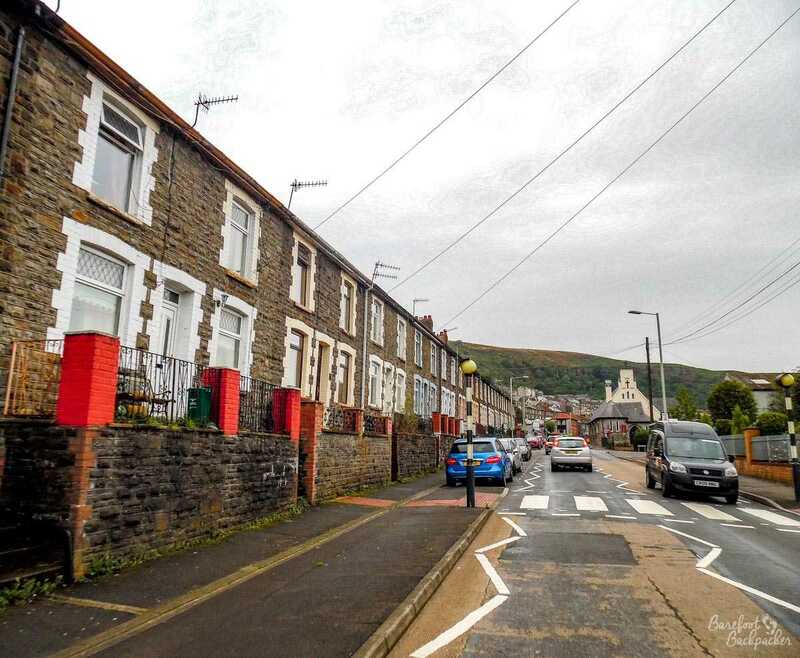 One of the many small towns in the South Wales valleys – this is Ferndale, in Rhondda Fach. TV comedy-drama ‘Stella’ was filmed here. A replica of a coal mine shaft, as seen at Big Pit, Blaenavon. It is to scale, yes. Coal mining was not a comfortable job. ‘The Rhondda’ is the area along two river valleys (the Rhondda Fawr and the Rhondda Fach – “big’ and ‘little’) in South Wales (the River Rhondda itself joins the Taff at Pontypridd, 12 miles NW of Cardiff) in the heart of an area of steep mountains and beautiful scenery, pretty much all of which were most noted for mining, Others in the area include the Merthyr, Cynon, Taff, and Ebbw rivers; isolated valleys which were originally strong Welsh-speaking areas hidden away from the rest of Wales but once coal was discovered they become very industrialised centres, attracting people from all over the UK. Much of the housing is traditional brick terraces, uniform but definitely pretty, mostly two/three bedroom homes built by the mine owners to house their workers in. The villages are mostly linear, built along the road that runs up the valley, and founded to serve the local colliery – the steep craggy land up the hillsides aren’t suited for much agriculture other than sheep. Without the mining headstocks to demark, the rural countryside is amongst the most beautiful in the country, where even the old slap heaps have been grassed over and turned back to nature. The roads take Alpine-like detours and have ski-slalom gradients, and there is a very definite ‘other-worldly’ feel about the place. 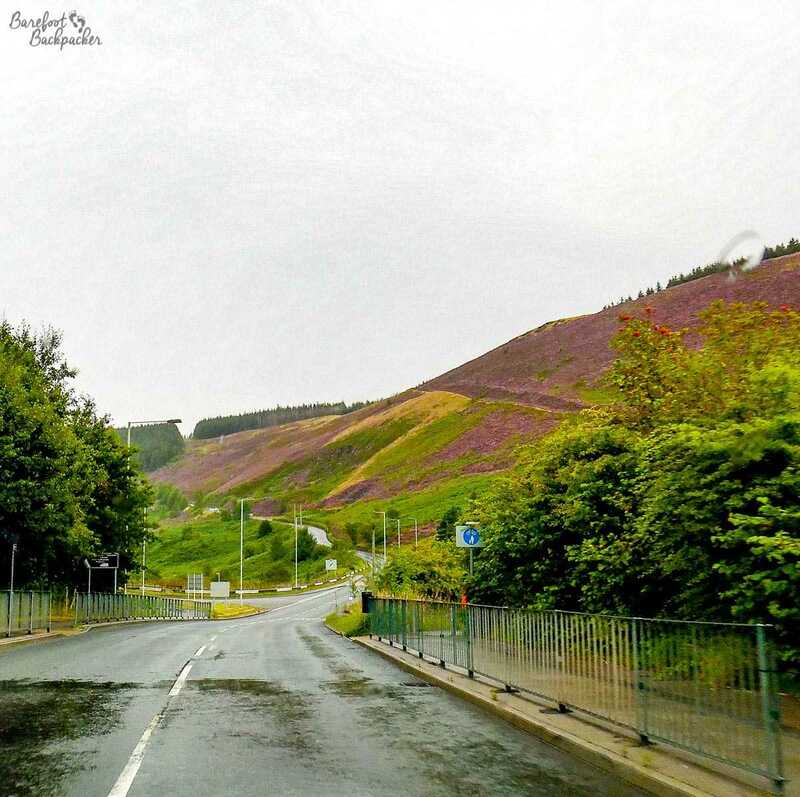 The main road in the Rhondda Fach, just outside Maerdy on the way to Aberdare. This calming and spectacular scenery belies the turbulent history of mining; it was an incredibly dangerous job. Pretty much every village has a commemoration to the colliery that once stood there, and the vast majority of these also include a memorial to those that died down the pit. Sudden floods (Main Colliery, Neath, 1859, 26 dead), collapsing mine shafts and poisonous fumes (though mostly as a secondary factor), device failure (Victoria Mine, Aberdare, 1848, 12 dead when the lift transport collapsed) and of course the ever-present danger of gas explosions (amongst others, Maerdy Colliery in 1885, 81 dead) all made families destitute (the man was usually the only breadwinner) and communities mourn. 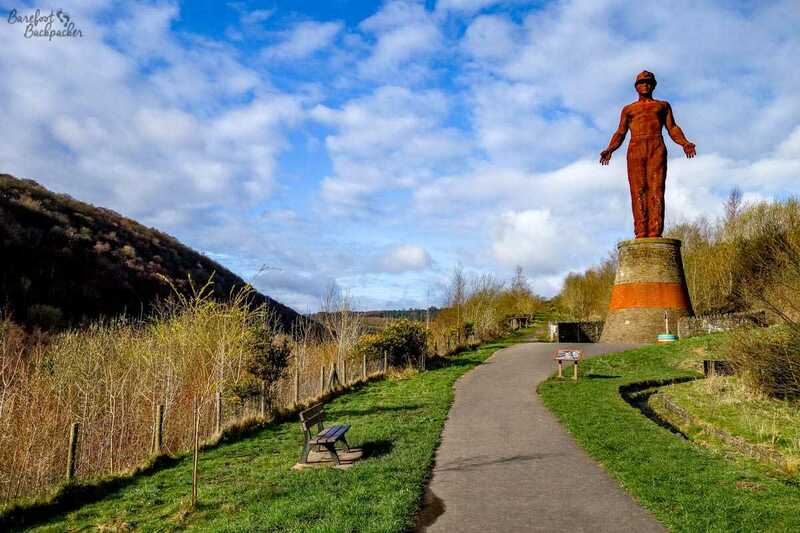 Just outside Abertillery, in the Ebbw Vale, there is a huge mining memorial (the Guardian) dedicated to one such incident at Six Bells Colliery in 1960, when 45 miners died. The large Guardian Memorial to the 1960 disaster. It stands on the site of the colliery, now a landscaped country park. It wasn’t just down the mines themselves where there was danger. One of the most infamous incidents in Mining history occurred in South Wales, in the village of Aberfan in the Merthyr Vale. One of the side-effects of mining is that, because you’re digging out a lot of earth to get at what you’re after, you have to do something with the stuff you don’t want or need. Invariably this gets piled up in man-made hills of loose rock, dirt, and other detritus created as a by-product of the mining process. Many of these piles of debris across the UK have been landscaped since the closure of the local colliery and have become parks or nature reserves (indeed the area around where I live is this to a tee), however at the time they remained large piles of unwanted dirt that loomed over colliery towns and merely added to the grim, grey, vistas that such town exuded. Dirt, of course, is soluble (it forms mud when mixed with water), and not particularly stable, and South Wales isn’t noted for its arid climate (an old penpal of mine from nearby Llandeilo told me “never camp on the Gower (peninsula)”, words that have stayed with me for 23 years!). The area around Aberfan was subjected to sustained heavy rains in mid-October 1966, which affected the stability of the dirt pile that had accumulated over the years from the nearby Merthyr Vale colliery. The size of the ‘hill’, combined with the amount of rain that fell, caused a landslide that shifted upwards of 150,000 cubic meters of soil and mud. 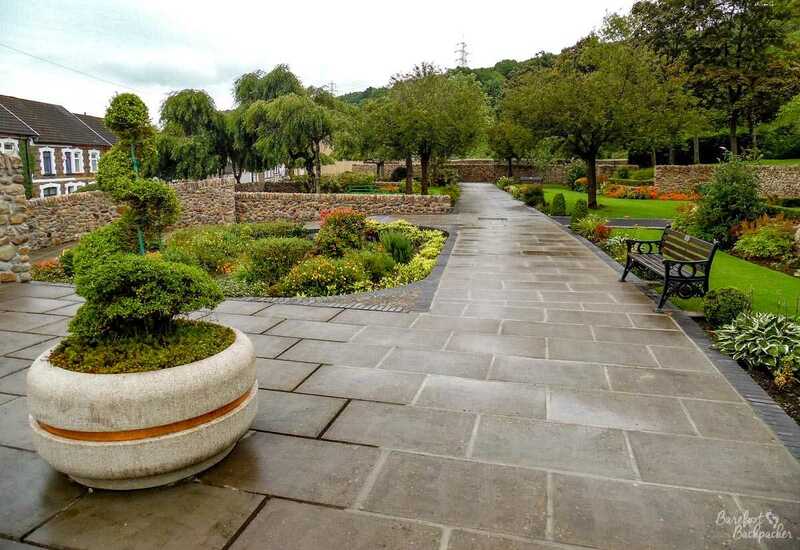 The memorial garden on the site of Pantglas Junior School, Aberfan. The landslide was so quick that no warning could be given. In a further twist of the knife, it happened at 9.15am, during school registration, so the school was pretty much full. Of the 240 children present, 109 (so just less than half) were killed in the school itself, along with 5 teachers – the total death toll of the disaster was 144, including 116 children. The slide also destroyed 18 houses nearby, damaged the neighbouring secondary school, and the associated water flooded much of the surroundings in the village. It took a week to recover all the bodies; the clean-up took a while longer. Although the official enquiry following was a bit of a fudge, it was one of the motivators behind the 1974 Health & Safety at Work Act, so they didn’t die completely in vain. And the slag heap was removed. But not for a couple of years. Of course this all led to a strong community spirit (a feeling of ‘we’re all in this together’, and a desire to help your neighbours). It’s unsurprising therefore that South Wales has always been a strong supporter of socialist ideals – indeed a roll-call of leading British Labour politicians throughout history has a very strong Welsh bent (Neil Kinnock and Aneurin Bevan, to name but two). It’s also been a hotbed of philosophical thought – the Chartists (a mid 19th Century constitutional change movement) had a strong following here, and the area was home to a similar strong Trades Unionist following (the first elected MP from a Trades Union/Working Class background was William Abraham, MP for Rhondda from 1885). 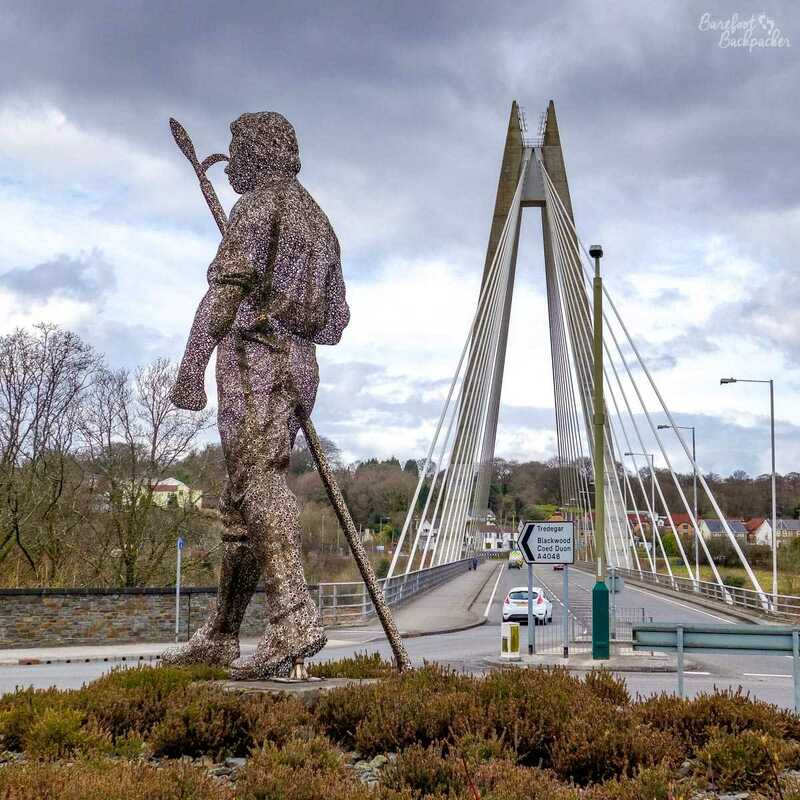 The Chartist Bridge and Statue, Blackwood. It commemorates the Chartist march to Newport; the statue is made up of hundreds of brass rings, signifying strength in unity. It hasn’t been just politics though that has united Welsh communities – religious fervour was present in these communities, with each village having its own chapel (Methodist, for preference); the remote location and political vibe giving rise to many a preacher, while the strength of community led to the development of the Welsh Choir, famous the world over. Indeed, music in general was always very popular, from the religious hymns, through folk ballads and political anthems all the way to the top of the charts – this is the home of everyone from Tom Jones (a product of the Rhondda itself) whose ‘The Green Green Grass Of Home’ is about as regional as it gets, to the Manic Street Preachers, from the Blackwood area of Caerphilly, who were products of the post-industrial landscape and their cynicism absolutely shows. 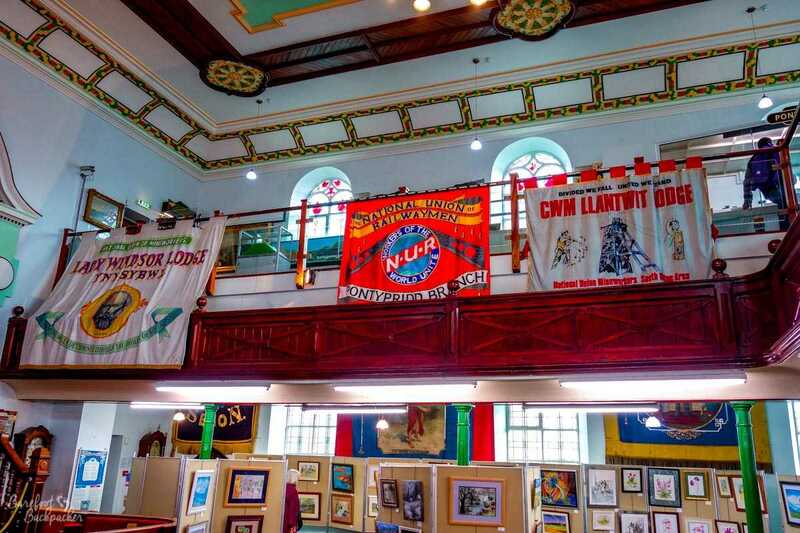 Local miner’s banners from protests like the Miner’s Strike, displayed in the Pontypridd Museum. It’s no surprise to learn that a combination of all of this led to Evan and James James, from Pontypridd, who wrote the song originally called ‘Glan Rhondda’ (‘banks of the Rhondda’), but now much more familiar as ‘ Hen Wlad Fy Nhadau’ – the Welsh National Anthem, and one of the very few pieces of music that, when sung by 50,000 people in a stadium, makes even me emotional. Of course, as stated earlier, the mines have all gone now. It would be nice to think that there had been some kind of political plan around this, to retrain workers, to encourage new industries to replace coal, to ensure continuation of these communities in the new world. Unfortunately, there seems to have been only short-term thinking applied – making coal mining profitable was the be-all-and-end-all, and since these towns and villages only had coal as their employer, this caused mass unemployment and poverty; in addition, with no industry there was no need for transport links so many of the valleys were effectively ‘cut off’ from the outside world for anyone who didn’t have a car. This led to a ‘drain’ of the workforce – those that could, left town and moved to where the jobs were (mainly Cardiff), exacerbating the poverty and dereliction in the Valleys – indeed a 2014 study indicated that six of the ten most deprived areas in Wales were in The Valleys (two of the other four were in Rhyl in North Wales). Ebbw Vale town centre. The clock is called ‘Echoes’ & is made of steel (representing the steel heritage) with clock faces that look like mining wheels. 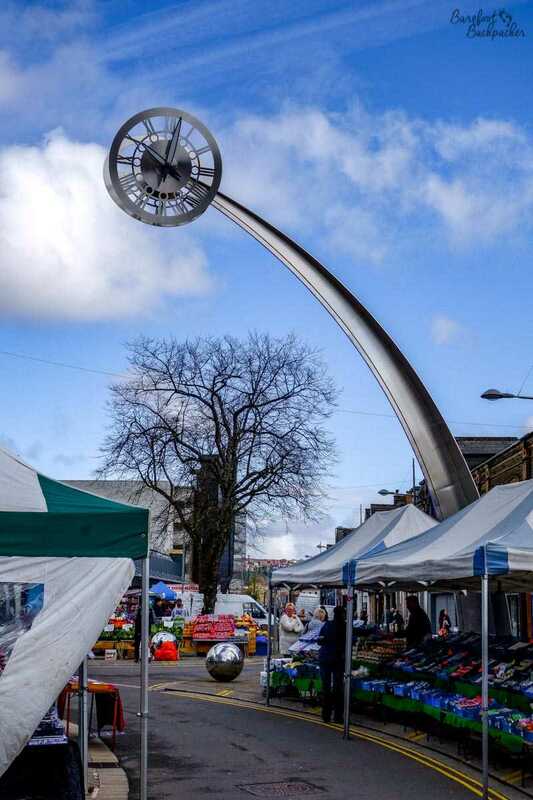 Ebbw Vale is one of those towns helped by EU money. 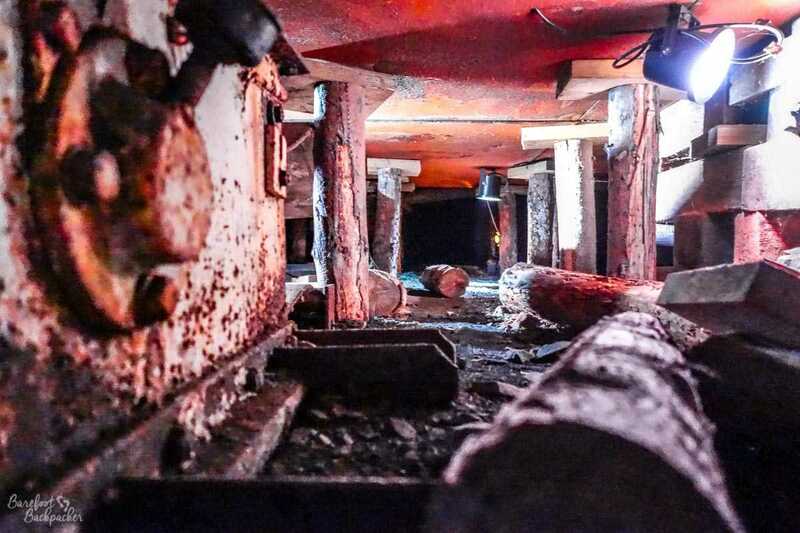 It’s slowly improving now – the railway lines are coming back, and ex-mining sites are being bought out by new companies attracted by cheap rents and eager workforce. Ironically, given recent events as I type this blog entry, European Union grants have helped redevelop the area (it being cited as one of the most deprived in the European Union). Call Centres nearer Cardiff have sprung up, while deeper in the valleys educational colleges and small startups have made their home. Ultimately, though, the main attraction these days is tourism; using Cardiff as a base, the Welsh Valleys are trying to attract people to visit the beautiful scenery and learn about the history – essentially the Valleys are becoming a ‘what we were’ rather than a ‘what we are’ – indeed one of Pontypridd’s attractions is a small museum dedicated to all things South Wales, documenting both the mining and the community history of the area. Nowhere is this more evident than the “Big Pit National Coal Museum” at Blaenavon; an ex-coal mine and associated ironworks that closed in 1980 but re-opened as a living heritage museum not long afterwards. Staffed by ex-miners, it is a preserved display of coal mining equipment and buildings, with not only a large museum with info boards detailing the lifestyle and history of the area and mining in particular, but also allows the visitor to see how the mine would have operated, with coal trucks, winches, and, spectacularly, the opportunity to go into a mine for real, to see the conditions that miners would have faced. It’s not a ‘sanitised’ experience – you can’t take mobile phones down there because of the still-present risk of explosions. Overview of the Big Pit museum at Blaenavon. It sometimes feels weird to step into a place that is such a part of local culture, but which now only exists for tourism purposes – dance performances by African tribes, ethnic music recitals, tours to previously sacred forests, and the like – and it’s even weirder to find it in your own country. There’s a quote from socialist Welsh historian Gwyn Williams who was concerned about this; at the end of the Miner’s Strike and not long after the museum opened, he opined “This is a museum. Wales is being turned into a land of museums!”. As an aside, I’ve attempted to visit the Museum twice now, and still not made it underground, both times because of civil service strike action for pay & conditions. At least someone is still fighting for the cause, in that traditional Welsh Trade Unionist way. Authorities visited: Rhondda Cynon Taff, Blaneau Gwent, Caephilly, Torfaen (10 April 2016), Merthyr Tydfil (30 August 2015).